The PTSP Goes To Mall in West Jakarta is nominated for Top 99 in 2018 in the public service innovation information system (Sinovik) of Ministry of Administrative Reform and Bureaucratic Reform (Kemenpan RB).
" 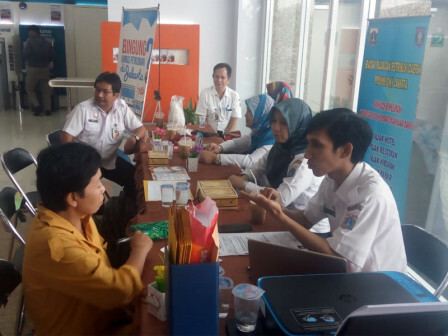 When the service opens, around 25-30 people come to the PTSP Goes To Mall outlet"
West Jakarta PTSP Technical Unit Head, Johan Girsang said the Sinovik team has done valuation towards the licensing service opened in shopping centers spread across eight sub-districts. He disclosed, PTSP Goes to Mall in West Jakarta that has been started since mid-2017 is deemed to effectively facilitate the people who want to propose various licenses. "When the service opens, around 25-30 people come to the PTSP Goes To Mall outlet," he expressed, Wednesday (7/4). Every citizen can come to the outlet without needing to come to the service point in sub-districts and urban villages. "People can also while shopping or open a business in the mall. Most of the people who came have purpose to propose SIUP, TDP and transportation," he told. This service is opened in malls in West Jakarta, starting from Central Park Mall at Jalan S Parman, Season City Grogol Mall, Lendeteves Taman Sari, Palem Cengkareng Park, Daan Mogot Kalideres Mall, and Lippo Kembangan Mall.